Private Calls are one-to-one connections between two WAVE users, or one WAVE user and one radio. Private Calls may occur via the Members List or the Contacts List in the WAVE Mobile Communicator and WAVE Web Communicator. The Members List is a list of all participants currently on a Channel and is specific to a Channel. It does not require configuration. In WAVE 2.0, there are no longer Broadband Contacts Lists. Instead, all users on all Talkgroups assigned to a User create the Contacts List for Private Calling. The Contacts list is a static list of members determined by the Customer. The instructions in this section explain how to create Subscribers for Private Calls and configure a Contacts list for Private Calls. For Broadband to Broadband calls via the Members list, no further action is required, however; Broadband to Broadband calls may benefit from a Contacts list. For information about setting up Contacts see To Configure Contacts on this page. Each WAVE User in WAVE has an individual Contacts list. When you add new users, their contact list is initially empty. Contacts are specifically for initiating Private Calls. Contacts for WAVE Users (Broadband clients) are configured in the Users page. Subscribers are users capable of making or receiving Private Calls with radios. Users who are not added as Subscribers cannot receive or initiate Private Calls with radios. Subscribers must be configured on the Radio System page. 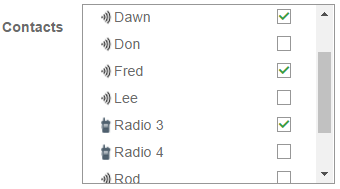 Radios and Broadband Users must be added as Subscribers to allow Private Calls between them. The following two procedures explain how to create Subscribers and add Contacts for Private Calls. These instructions start with the configuration of Subscribers, however; it is not required that you create Subscribers first or Contacts, although you cannot add Subscribers as Contacts until they are created. Subscribers are for Radio System Private Call integration. Subscriber Contacts exist in both WAVE 1.0 and 2.0. If you are using WAVE without radios (Broadband Only) then you can skip these instructions. Subscriber entries do not affect Broadband to Broadband Private Calls or Radio to Radio Private Calls. Their only purpose is to enable Broadband to Radio Private Calling and ID transmission. On the Radio System, click the Edit button. Scroll to the bottom of the page and click Subscriber list. Click the Add Subscriber button. NOTE: You can also upload Subscribers via spreadsheet using the Import button. 1. Click the IMPORT button. 2. Click the CSV TEMPLATE button. 3. Open and edit the CSV TEMPLATE file in a spreadsheet editor. 4. Save the file as a comma delimited list. 5. Click the IMPORT button again and then click the UPLOAD button. 6. Browse to and select the CSV file to upload. The page populates with the uploaded users. 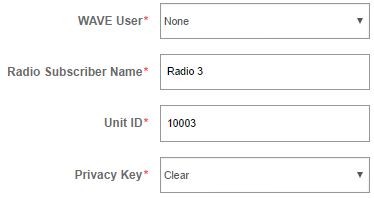 Leave WAVE User as None if you are adding a radio unit. In Radio Subscriber Name, enter the name of the Radio Subscriber as it will appear to WAVE users during PTT, Text Reception, and Private Calls. In Unit ID, enter the ID of the radio as it occurs in the connected Radio System. Privacy Key only appears if you are using Enhanced or Symmetric Privacy on the Radio System. If this field appears, then select a Privacy Key. To add a WAVE Subscriber, first select the name of the User to add as a Subscriber from the WAVE User list. The screen updates the fields to associate. In Unit ID, enter the ID this WAVE User will send to the Radio System for identification. The ID you enter must fall in the WAVE Subscriber Radio ID Start/End range set in the Radio System. The WAVE Portal will enforce this and notify you with an error if you use a Unit ID outside the range, or if the Unit ID you enter is already in use. Select Allow Private Calls to allow this WAVE User to initiate or receive Private Calls with Radio Subscribers. The new Subscriber appears in the Subscribers list. 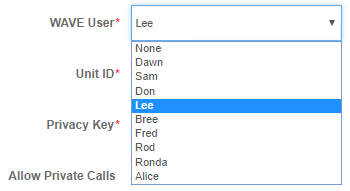 In WAVE 2.0, it is no longer necessary to configure Contacts. Contacts are automatically added from all users in all Talkgroups assigned to a User. For example, if you are a member of Talkgroups A, B, and C, then all the users on A, B, and C will appear in your Contacts list on the WAVE application. If the same user exists twice, then the duplicate entry is removed. 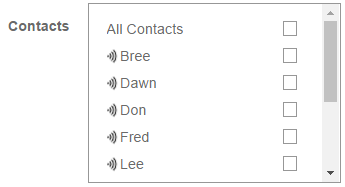 In WAVE 1.0, Contacts are for WAVE (Broadband) Users only. Individual radio units may be programmed for Private Calls using aliases that map to WAVE Unit IDs depending on the capabilities of the radio unit. Consult the documentation for your radio hardware for more information. Contacts added using the instructions below appear in the CONTACTS section of the WAVE Web Communicator and WAVE Mobile Communicators and may be used to initiate Private Calls. Click the name of the user to modify. Select the users to add as Contacts. Note: The User page also provides the Radio System Subscriber Association section. The Radio System Subscriber Association section allows you to provide Subscriber information for this User. The information in this section is identical to the information on the Subscribers page, allowing you to edit or add entries for this User without navigating to the Subscribers page.